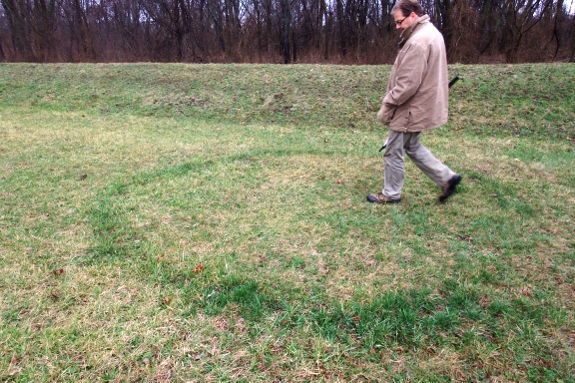 I'd never seen a fairy ring until last summer, when one popped up in a neighbor's yard back in Virginia. I'm still kicking myself for failing to take a photo! But I did get a shot of the winter symptom of the same fungi, shown above during our recent visit to Mound City. In a great example of the symbiosis of plants and mushrooms, fairy-ring fungi break down organic matter in the soil, releasing nutrients and creating rings of bright green grass that look like someone had poured fertilizer there. Unfortunately, they can sometimes also create rings of dead brown grass if the fungi block water movement or create hydrogen cyanide. As with much of nature, it's a crapshot whether the 50 species of fungi that form fairy rings will help or hinder your lawn. But they definitely increased our enjoyment of the Mound City site!